Nepenthes alata comes in many forms! All highland, intermediate, and lowland varieties are available for retail. They range from all green forms to spotted, red, striped, and elongated forms. I grow all of my N. alatas outdoors as highlanders. Most of the varieties I have originated from Exotica Plants. I'm not sure how many different forms they have, but the highest letter variety I grow is the "r". I suspect one could have a good sized collection of Nepenthes by only collecting N. alata forms! 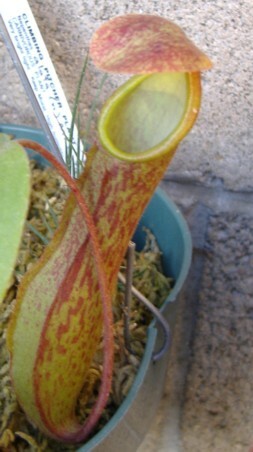 N. alata can produce good size pitchers and makes one of the best beginner's plant to start with because they are hardy, grow fairly quickly, and are inexpensive for their size. I've seen rooted cutting size plants for under $20! I've noticed that lowland to intermediate forms of N. alata do not do well when my winter temperatures get into the low 40's for extended periods of time. The will stop growing the the growing tip will blacken or brown. Although alatas are some of the hardiest and easiest Nepenthes to grow, it is important to keep them in their desired temperature ranges. 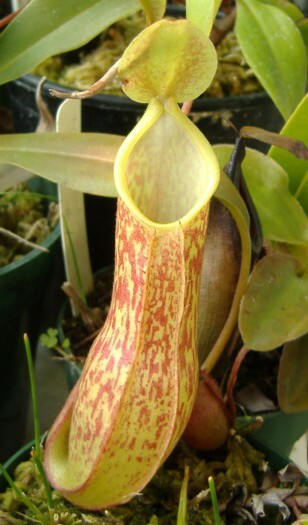 This is an ideal starter plant for outdoors or indoors if you want to get started growing Nepenthes around the house. Established large plants to rooted cuttings can be purchased relatively cheap. They are also very tolerant of lower humidity levels and transplant easily. My guess is that most N. alatas available are probably too big for a windowsill but would make an excellent hanging basket Nepenthes by a well lit window. If growing outdoors, then provide diffused light at first as your plant adjusts to outdoor growing. Then once acclimated, you can move to a sunnier area. 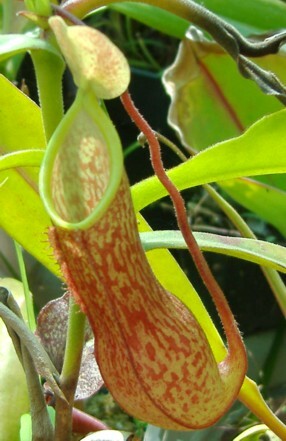 Nepenthes placed in direct sun can have their leaves bleached by the direct sun and lower outdoor humidity. So when anyone asks me what plant they'd like to adapt to windowsill growing or outdoors, I always recommend N. alata. Because this species is easy to grow and readily available, I think the overall beauty of this species is easily overlooked. Cultivation: one of the easiest! good grower and very hardy, excellent starter plant, lowlanders don't like temperatures in the mid 40's. Species variability: many! green, spotted, "Luzon", "boschiana mimic", "giant", A, B,... Q, etc. and many other locality names.